The Hoboken Harriers have been showing up to TTB since our first year of races, WAY back. Based in Jersey, they come to town to compete hard. Last year they took 1st place in the NYRR Team Champs B Division, and have regularly placed well at unsanctioned races in the city. We spoke with HOHA Coach, Michael Anderson, to get the full history of the club, and to learn why HOHA is a team to watch at, our final race this year. 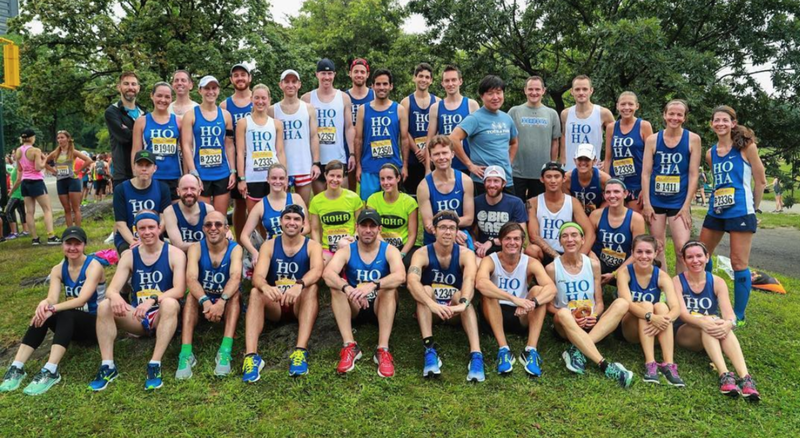 The Hoboken Harriers (HOHA) were founded in 1988 by a group of young Hoboken-ites who loved running, supporting community causes and gathering for post-run brews and conversation. At the top there were some pretty competitive runners among a group that was open to all levels. For the most part, not much has changed. HOHA supports local charities (such as the Jubilee Center -- a local gathering spot for Hoboken youth to receive mentoring and educational support), and the group participates in park cleanups and other community efforts. Our two biggest events per year are the Snow Ball (festive February party!) and the HOHA Classic 5 Miler which recently celebrated its 20th year. Proceeds from those events go to benefit the Jubliee Center. BOTH! Just don't call us 'WHO HA'!. Our official name is Hoboken Harriers but we love hearing, "GO HOHA" at races. IT'S FUNNY, AS MANY OF OUR NY FRIENDS MOVE TO JERSEY, WE SEE THEM JOIN UP WITH HOHA! TELL US ABOUT YOUR MEMBERS! Definitely a diverse group! Most are local NJ and PA natives that settled here after college and have remained. Others escaped high Manhattan rental prices and found Hoboken/Jersey City and some moved to the area for a new job and settled on Hoboken/JC. We also have a few grad students from the Stevens Institute who found us after their college running days came to an end. Just an old school tradition of gathering for "libations" (beers/drinks) post run on Tuesday and Thursday nights. HOHA MAKES A REGULAR APPEARANCE AT OUR TTB RACES AND AT OSR. WHAT IS THE APPEAL OF COMING INTO THE CITY FOR THESE RACES? I guess we are night owls! Our runs start at around 8pm during the week and a lot of our members either work very late or have tough commutes so late workouts and races are appealing. And any race that features a post-race party is also right up our alley. WHAT SHOULD WE ANTICIPATE FROM HOHA IN THIS NEXT RACE? Aside from 4 to 5 mainstays, the rest of the club is new to the unsanctioned running community -- so expect a lot of newbies that might not know the nuances of the course and when to drop the hammer. We definitely will be bringing some competitors who hope to mix it up in the top 10. The Thursday night run is a favorite for sure. Another popular run is our 6 and 9 mile Saturday Run. It features an insane hill climb at mile 2 - you are rewarded at the top with an incredible view of the skyline. We host 'unofficial' track workouts on Wednesday nights. Since these are not held year round, it is not featured on our website. Typically one of our runners (Joseph Black or Kyle Bevilacqua) will post to the workout to our FB page and a group of about 8-10 runners will head to the track in Weehawken NJ (a perfect 1.5 mile warmup from the center of Hoboken) for some intense 400s, 800s etc. Definitely Moran's. The staff is awesome and they always have a few pitchers of water waiting for us year round. Great beer selection and they put up with sweaty customers. That's easy... Francisco Balagtas is one of our runners. Definitely pizza. A close second is Mamoun's. Two years ago, a group of (at the time) new HOHAs started calling themselves the 'New-HAs' and have made Momoun's their chow spot after Moran's. TM + Copyright 2018 Take the Bridge Events LLC. All Rights Reserved.